Is it un-African to lead with integrity? IF I didn’t know better, I would have rushed to accuse organisers of various Black Monday pickets against farm murders across the country of colluding with President Jacob Zuma and his spin doctors. How else would anyone expect me to take it when news coverage of their country-wide pickets easily eclipsed new revelations in weekend newspapers of more damning stuff about the ties that seem to bind the president and some members of his family to a network of individuals who are said to lurk in the underworld, as well as the same president’s apparent dependency on the largesse of people whose business enterprises can only thrive when they break our laws? Does President Zuma remember the late Jackie Selebi and how it ended with him? Was it a simple hunger for different, juicy, news or has the public’s appetite for new revelations involving the president reached its zenith? Have South Africans entered the dangerous zone of becoming blasé? Or has the reappearance of old South African and AWB flags – both of which are symbols of racial hatred in the eyes of most black south Africans – finally proven to be bigger drivers of citizen anger than the continued kleptocracy and mismanagement of our state institutions? It is common cause that South Africans, by and large, have come to expect nothing good from this president. If any credit is due to him, that would only be for his consistency, right from the time he was deputy president in his uncaring drive to be the biggest presidential disappointment of modern day South Africa. Few of us can dare point fingers elsewhere, of course, because most of us - including this writer – fell for the singing, the dancing and the charm that came with the Zuma package about a decade ago. We believed him when he played victim and, tired after eight years of a Thabo Mbeki overdose, we also believed everything we were told about the anti-Zuma scheming that took place in the Mbeki kitchen. 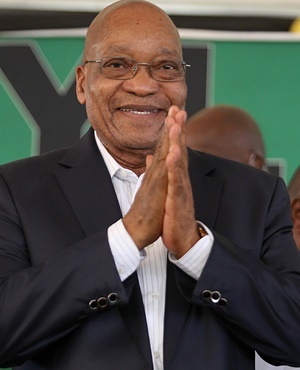 At the time, many were even happy to swallow the lies by Advocate Mokotedi Mpshe – he who was brought in to drop the notorious 783 criminal charges against Zuma before being promoted to acting judge – when he told us that the charges would not withstand legal scrutiny because a team supporting Mbeki had discussed the timing of their being brought to bear on Zuma. Despite being, arguably, a more presidential and dignified man than the current president, Mbeki did not win himself much favour during his second term. And he too was victim of only his perceived obstinate aloofness and seeming belief that only he could be right in everything. After all, he defended one Robert Gabriel Mugabe at the height of his madness as he went about wrecking his country’s economy, stealing elections and causing the flight of millions of Zimbabweans across regional borders, fearing for their lives. Mbeki was also the first to plead with the International Criminal Court to give Sudanese president Omar al Bashir a chance instead of arresting him for alleged human rights abuses in his country; and he denied crucial ARVs to hundreds of thousands of South Africans whose lives could have been spared opportunistic diseases linked to HIV-Aids. He was also the first post-apartheid president to remove a respected national director of public prosecutions from office after the latter ignored pressure, apparently from the president, to look the other way and ditch plans to arrest a corrupt and captured police commissioner, despite mounting evidence that the said police commissioner’s toxic links to the criminal underworld would eventually pose a danger to national security. At the time, people used to say that whereas Mbeki had a very restricted kitchen cabinet that he consulted on major decisions - even to the point of excluding leaders of Cosatu and the SACP - Zuma would usher in a more collegial leadership and decision-making style that would restore space near the political fireplace for the alienated leaders of the ANC’s Tripartite Alliance partners. It all made sense at the time and we fell for it. We were not told, of course, that ‘collegial leadership’ would involve shifting the responsibilities of his office to a compound occupied by a family of suspected criminal immigrants. Now look at where we are. Our economy is in junk status; our currency has been weakened; our state-owned entities have been looted; inflation is high; unemployment levels have risen; our national debt as a percentage of gross domestic product is fast becoming unsustainable, and tax compliance - including by the president himself - is at its lowest. The ruling party has consistently defended its president, ensuring that he continues to occupy the highest office in the land and uses the powers vested in that office to wreak more havoc on any chance of our country finding an easy way to climb out of the hole they have enabled him to dump us in. Those who, through deliberate intent or inexplicable ignorance, continue to pretend there is no link between the disastrous leadership of Zuma - and, increasingly, the ANC - and the poor state of our institutions and economy, need to wake up. The constant shielding of individuals whose actions are bad for our country and its institutions - be it on Marikana, Nkandla, Zupta state capture, the alleged Zuma links to the criminal underworld, the management of Sassa, the looting of SOEs, the deteriorated state of Johannesburg, a once thriving and clean city, the imbroglio around the Life Esidimeni tragedy, and many others will not help our country regain lost goodwill. It has become clear to those who dare to admit it that lasting solutions will not be found without a clean leadership change, starting in the office of the president. Simply coming up with a raft of populist policies aimed at exciting the masses with false, unrealistic promises developed by unknown people in unknown places and communicated through spin will not help. South Africa needs a clean start under new leaders. I no longer believe those leaders will be found in the current ruling party. Solly Moeng is brand reputation management adviser and CEO of strategic corporate communications consultancyDonValley Reputation Managers. Views expressed are his own.